Fast cycling can burn more calories than walking. Many people find themselves in a quest to locate the perfect exercise that will improve health, burn calories and keep the body toned. But no single exercise is necessarily better than any other, and whether biking or walking will help you lose more weight depends on the nature and frequency of the exercise you perform. While cycling offers more opportunities for high intensity, walking doesn't require any equipment. Choose your exercise based on what works best with your lifestyle, and consult with your physician before beginning any new fitness routine. Both cycling and walking are forms of cardiovascular exercise that elevate the heart rate, increase the body's oxygen use and burn calories. Over time, cardio can improve your heart and lung health and reduce your risk of a heart attack or stroke. The Centers for Disease Control and Prevention emphasizes the importance of cardiovascular exercise and recommends 75 minutes of high-intensity cardiovascular exercise or 150 minutes of low-intensity cardiovascular exercise per week. Walking is generally low-intensity exercise, and cycling can be either low or high intensity depending upon your speed and the degree of incline upon which you cycle. To lose weight, you have to create a caloric deficit. This means that, even if you're getting lots of exercise every day, you won't lose weight if you're eating too many calories. One pound of fat is equal to 3,500 calories, which means you have to eliminate 500 calories each day through a combination of diet and exercise to lose 1 pound per week. Cycling primarily works your lower body, including the calves, quadriceps, hamstrings and glutes. However, you can also get a moderate upper-body workout if you lean forward while cycling or use your abs to help push yourself up an incline. The number of calories you'll burn cycling depends upon your body weight and the intensity of your cycling. 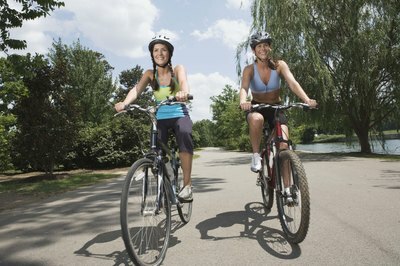 A 125-pound woman can expect to burn between 240 and 495 calories in 30 minutes of cycling. Walking almost exclusively works the lower body unless you swing your arms or carry weights while walking. 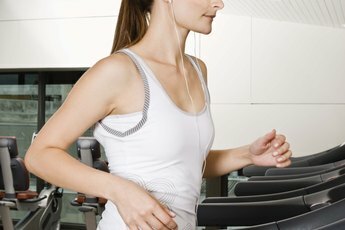 Walking on an incline can increase the intensity of your workout, as can increasing your pace. Your total calories burned vary greatly depending upon the intensity and duration of your workout as well as your body weight. For example, a 125-pound woman can burn 120 to 195 calories in 30 minutes of walking. 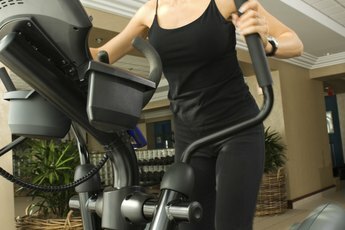 If you're hoping to increase the calories you burn with your workout, try high-intensity interval training. During your walk, sprint for 30 to 45 seconds every two to three minutes, then return to walking. If you're cycling, increase your speed to near maximum speed for 30 to 45 seconds every two to three minutes. 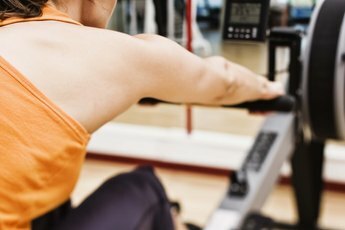 This interval training workout speeds up your metabolism, builds muscle and increases the number of calories you burn without increasing the duration of your workout. Are Walking Lunges a Quad or Hamstring Exercise? Can Walking Up & Down the Stairs Be a Total Body Workout?